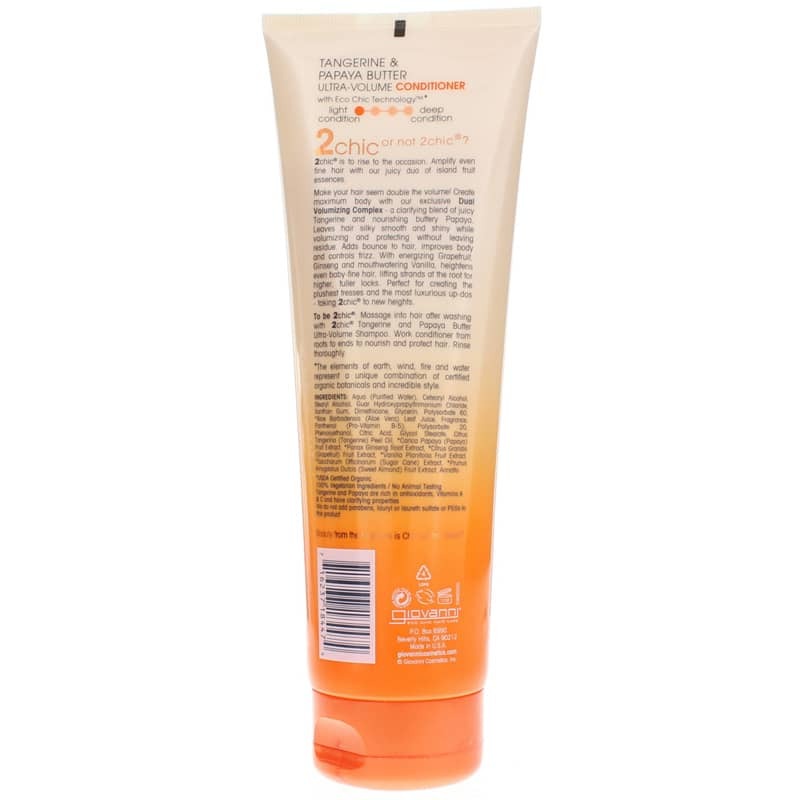 2 Chic Ultra-Volume Conditioner from Giovanni is a thickening conditioner that gives fine, limp hair softness and body with tangerine and papaya butter. 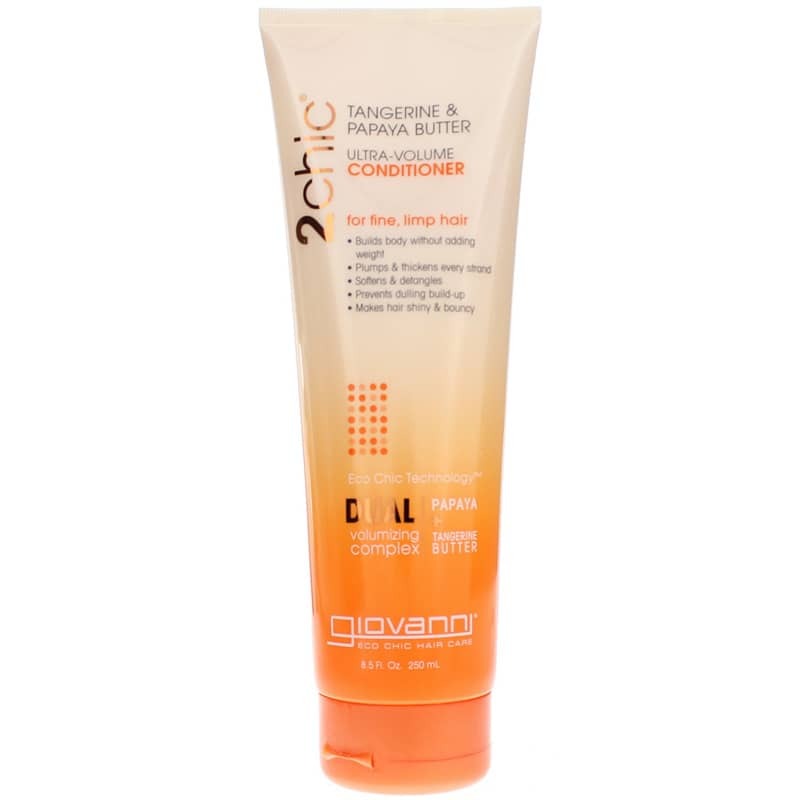 Featuring Giovanni's Eco Chic Technology, 2 Chic Ultra-Volume Conditioner has a dual volumizing complex of tangerine and papaya butter. This formula helps build body without adding weight or greasiness. And it still softens and detangles. Free of parabens, lauryl and laureth sulfate, and PEGs. Plus it's made with 100% vegetarian ingredients and is cruelty-free! Meet all of your voluminous conditions for beautiful hair with body. Order 2 Chic Ultra-Volume Conditioner today! Aqua (Purified Water), Cetearyl Alchohol, Stearyl Alcohol, Guar Hydroxypropyltrimonium Chloride, Xanthan Gum, Dimethicone, Glycerin, Polysorbate 60, *Aloe Barbadensis (Aloe Vera) Leaf Juice, Fragrance, Panthenol (Pro-Vitamin B5), Polysorbate 20, Phenoxyethanol, Citric Acid, Glycol Stearate, Citrus Tangerine (Tangerine) Peel Oil, *Carica Papaya (Papaya) Fruit Extract, *Panax Ginseng Root Extract, *Citrus Grandis (Grapefruit) Fruit Extract, *Vanilla Plantifolia Fruit Extract, *Saccharum Officinarum (Sugar Cane) Extract, *Prunus Amygdalus Dulcis (Sweet Almond) Fruit Extract, Annatto. 100% Vegetarian Ingredients. Cruelty-Free. No Animal Testing. NO parabens, lauryl or laureth sulfate or PEGs added to this product. Massage into hair after washing with 2 Chic Ultra-Volume Shampoo. Work conditioner from roots to ends to nourish and protect hair. Rinse thoroughly.